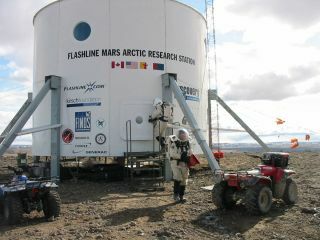 Crew members doing a simulated spacewalk at the Mars Society's Flashline Mars Arctic Research Station on Devon Island, Canada. Just like astronauts, crewmembers will spend most of their time doing science, studying things such as carbon release from the permafrost and human performance in extreme conditions. If they want to go outside their base, they'll have to wear a spacesuit. If something breaks, they're the ones who are going to have to fix it. NASA, for its part, aims to get humans to the vicinity of Mars by the mid-2030s. The space agency is also sending an astronaut on a one-year mission to the International Space Stationin 2015 to help prepare for longer space missions.